Rajaguru Thathachariar was not happy about Tenali Rama joining the King’s court as a jester. Every time, when he had an opportunity the Rajaguru insulted Tenali Raman in front of others in the court. Tenali Rama was very upset about this and was waiting for the right time to take revenge. One early morning, Tenali Rama saw the Rajaguru taking bath in the river. Knowing that no one else would come there around that time, Tenali Rama quietly sneaked towards where the Rajaguru’s clothes were lying, picked them up and ran behind a tree. He was waiting for the Rajaguru to come. When the Rajaguru returned back after bathing, he was worried not finding his clothes where he had left them. “Who has taken my clothes?”, the Rajaguru shouted, looking around to see if anybody had taken his clothes. Just then Tenali Rama came out from where he was hiding, laughing at the Rajaguru. On seeing Tenali Rama with his clothes, the Rajaguru got angry and shouted, “What are you doing with my clothes? Give them to me before anyone sees me like this"
Tenali Rama laughed loudly and said, “I will give them to you on one condition"
“You will have to carry me on your back till the palace gate”, replied Tenali Rama. Rajaguru was shocked to hear this. He was worried about what others would think, if they see him without clothes. So he agreed to Tenali Rama’s condition. Then Rajaguru carried Tenali Rama on his back and walked towards the Palace. Everyone who saw them wondered, why the Rajaguru was carrying a jester on his back. Rajaguru put his bead down with shame, while Tenali Rama was happy that he had insulted the Rajaguru. Meanwhile, the King from the palace saw these two men at a distance walking towards the palace. The king was puzzled to see someone carrying another person. He ordered the guards to bring those two men to him. Tenali Rama had seen the king’s action and realised what would have happened. He quickly got down from the Rajaguru’s back. “I am sorry for having made you carry me like this”, he said. “Please allow me to carry you on my back from here”, Tenali Rama added. Not knowing about Tenali Rama’s trick, Rajaguru gladly climbed onto his back. Just then the guards grabbed them and brought them before the king. The guards told the king that, the Rajaguru was riding on Tenali Rama’s back. The King looked at Rajaguru. Rajaguru didn’t want to tell others about how he was insulted by Tenali Rama. “Lord, my legs were paining and Tenali Rama offered to carry me on his back”, he said to the King. Then the King warned him not to exploit other men like this in the future. 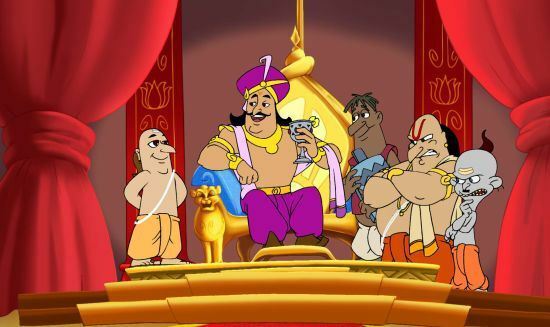 Tenali Rama was laughing inside with pride for having insulted Rajaguru in front of the King. Hm… Interesting so whole story was all about insulting each other. This is very strange; I thought it would be some morality conclusion there. However, nothing except tricky Tenali and stupid Rajaguru weren’t there. In real life, only the dumbest bully can behave like that, but I really don’t know about pay him with the same coin. I would be happy if you will explain me about that. At least I know that rewarded essays have logic more similar to mine.